The seclusion wasn't something I gave much thought to, however. I'd been raised with it, and I'd become very adept at keeping myself entertained. Furthermore, I had my nephew, John, to keep me company on a regular basis through the later 70's and early 80's. Although I call my friend Brian Z. my "best friend," the truth of the matter is that John was my best friend through most of my teens. He spent many summers at my house, and my brother and his family moved next door to us sometime around or shortly before 1980, IIRC, after which I saw John even more frequently. We basically grew up together. Unfortunately, my memory of 1980 and the surrounding years has grown extremely fuzzy, so exact dates are impossible to determine. For a long time, I had thought that I'd been introduced to role playing games in 1980, but I've realized in recent years that it must have actually been 1981. And, as I've mentioned before, my first hobby-related possession wasn't a set of D&D rules. Or any other role-playing game rules, for that matter. No, my first hobby-related possession was a D&D module: A3, "Assault on the Aerie of the Slave Lords." Based on the fact that the aforementioned friend's birthday was in December, and that - according to the Acaeum - A3 was published in 1981, I'm guessing the date of this event was late November or early December of 1981. That crunches the timeline I'd originally envisioned for my entry into the hobby, which I'd thought had run from December 1980 to Christmas of '81. But those years have blurred with the haze of time and age, and I perceived the passage of time far differently as a youth than I do now. The days passed more slowly, then; a month then is like six months now. Anyway, that enigmatic orange-yellow-covered book with its wonderful maps and imagination-sparking illustrations was my first step into the world of D&D. Mind you, it wasn't the first time I'd heard of the game. I'd seen and been moderately intrigued by the books in KayBee Toys in Riverside Mall*. (I was especially enthralled by the cover of Eldritch Wizardry - go figure.) So I'd known about the game for some time; it had been on my radar, but wasn't something I had any interest in. For some reason I'll never fully comprehend, my demeanor toward the game changed drastically around mid- to late 1981. With the simple discovery that the aforementioned friend's older brother and his friends (who would have been the "freaks" if my life at that time were an episode of Freaks & Geeks) played the game, I suddenly found my interest in it blossoming. 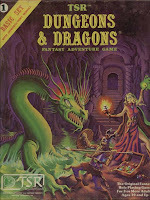 I imagine this was partially fueled by media hype surrounding D&D (the new "fad" was - it seemed - forever appearing in various news outlets back in the day), by the ever-growing line of products for the game, by the growing buzz surrounding the fantasy genre - and probably more than a little by my Hobbit-loving 8th-grade English teacher. Shortly thereafter - according to the revised timeline - I discovered that the local lawn and garden supply/toy store (yes, they sold toys next to the riding mowers) sold the yellow-box series of Grenadier miniatures for D&D. I bought (read as: coerced my mother into buying for me) my second piece of D&D paraphernalia there: the "Specialists" boxed set. As Christmas approached, I began to think more and more about the game. I envisioned my character (before I knew that term, as it pertains to the hobby) - the paladin from the Grenadier set - descending into a valley on a narrow path through a dense forest full of giant mushrooms**, a beautiful princess at his side as he used his gleaming sword to hew his way down the vine-choked stones. He was an elf prince himself, called "Moordow." 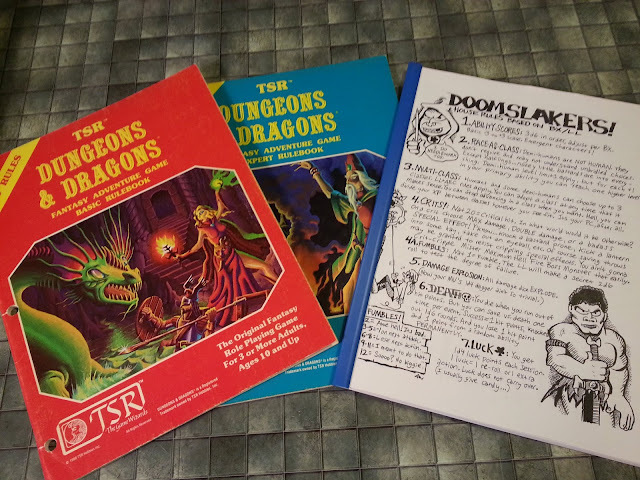 So, when C-Day came, it seemed like a no-brainer that D&D would be nestled under the tree. I say "seemed like" because it wasn't an unheard-of occurrence to not get what one wanted most for Christmas. Parental concern and other factors could always trump youthful desire, and such statements as "You'll shoot your eye out!" or "You'll become a Satanist!" could easily supersede a child's "I want that!" Sure enough, though, it was there - in the form of a lurid pink box bearing a brilliant Erol Otus cover. My friend Brian had also gotten a D&D box set for Christmas, and during the Christmas break we planned for him to come over to my house so we could play our first game. I think it was either shortly before his arrival that day or the day before that my nephew and I rolled up our first characters. (I don't recall Brian being there, although it's possible my hazy memory has failed me yet again.) We made a pair each, and Moordow was of course my first. And it was an abysmal failure. We abandoned our first session of D&D after a few encounters, slightly disillusioned (at least in my case), and opted instead - I think - to play Dark Tower. But it didn't matter. My imagination had been ignited, and it would take more than a bad initial game session to deter me from enjoying the Hell out of the game. Subsequent sessions with just my nephew and myself - with me as DM/co-player, running "modules" of my own creation - fared far better. My foray into D&D that began with an alien "adventure module" could have ended if that book had gone to its intended owner. It could have ended if I'd not received the game for Christmas. It could have ended after an initial game session of criminal mayhem. Ah rural Northern NY, I shudder at the mere thought of it. (I grew up in Watertown). Riverside Mall, sigh. sad to hear that it's gone. I haven't been back there in ~ 20 years, but have many fond memories of wandering those halls. Going to Friendly('s) for ice cream at the end of a day of shopping was a rare but relished treat when I was a wee lad. The Busy Bee at the mall in San Bernardino was my where my father first bought D&D for my brother and I in 1980, and was our main source of materials until a hobby store opened in the High Desert a year or two later. 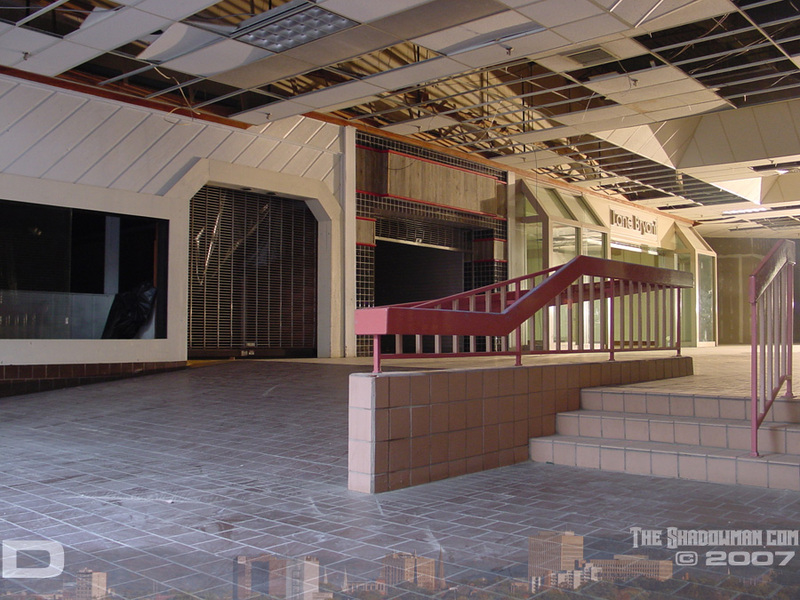 @Timrod: Yeah, they ripped it apart to convert it into a really skeezy looking strip mall - Walmart, Lowes, etc. Last I heard, there was still a section of it standing, but gutted. Of course, it wouldn't surprise me if that's been torn down by now as well. I want to thank you for this. This moving picture of how you came into the hobby was a great read (and not unlike my own - part III especially).